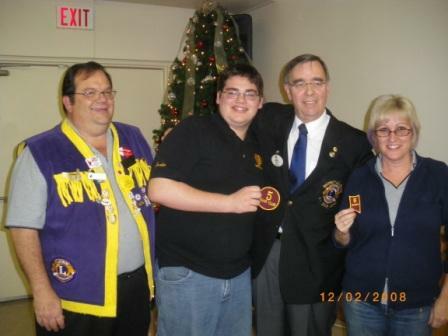 District Governor Don McKessock presented the Petrolia and District Leo Club with a Five Year banner patch from L. C. I. F. The Lions Club of Petrolia was presented with a Five Year chevron as the Leo’s sponsor, to be placed on their awards banner. Pictured are L. To R: Lion Toney Beaulier, Leo Justin Beaulieu, Gov. Don McKessock and Lions Club President Sharon Hornbostel.